Bed bugs are commonly mistaken for other bugs. This is largely due to the fact that many people have never had the misfortune of seeing one in person. Sadly, this means that people are constantly treating for bed bugs when they really have carpet beetles. Even professionals have misidentified other insects for bed bugs. When a person observes a small bug crawling across their bed, because of bed bugs in the news, they automatically assume it is a bed bug. Well in many cases, it is, but in many cases, it isn’t. The most important part of any professional treatment is identifying the bug for what it is and what it is not, because of life cycles, nature and treatments vary with each insect. Even the bed bug bites can be misidentified pretty easily. 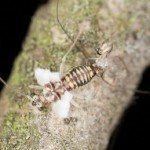 Many people assume that any unidentified bites are from mosquitos. 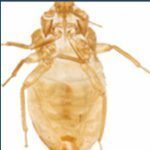 Bed bug bites resemble other bug bites in appearance and feel, so it’s understandable that people may not realize that they have a growing bed bug problem until the connect all the dots. The scary part is that this, “not knowing” or assuming can lead to large and hard to eliminate infestations. First, let’s talk about the bites. Bed bug bites are small raised welts that are itchy. They closely resemble a mosquito bite and cause a lot of the same reactions for people. 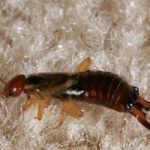 Bed bugs are different than other bugs in their bite pattern though. Bed bugs prefer exposed skin around the neck, hands, arms, legs, and face. Their triangular patterns of 3 bites set them apart from mosquitos. Often referred to as “breakfast, lunch, and dinner” the 3 closely clumped bites are often one of the first ways that doctors and victims identify a bed bugs bite. Most of the time, bed bugs bites will go away on their own in a few days just like a mosquito bite. However, there are people that can get a more serious reaction that requires medical attention. It’s not unheard of to develop blisters and welts that become inflamed, infected, and required immediate medical intervention. An anaphylactic reaction is also possible and requires the bite victim to go to the hospital right away. Some people who take regular antihistamines may not react to bites. And some may not react for weeks. 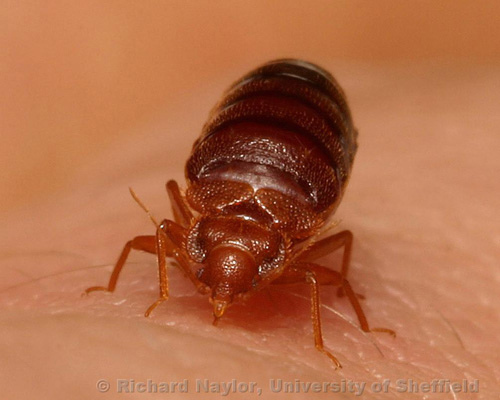 The bite from a bed bug can irritate symptoms of other underlining conditions as well. Only you know your body and if at any time, you feel the need or are suspect of a more serious problem from any bite, rash or reaction, do not delay in seeking immediate medical attention. Next, let’s look closely at the bed bug and examine its physiology from eggs, through instar development to adult. This is a highly magnified bed bugs egg. Notice the egg has a small “hatch lid” at the end of it. This is where the bed bug emerges. Once hatched, the young nymph’s body is also translucent. As they make the transition from one nymph stage to the next, a blood meal is always required. They “outgrow” their previous skin and shed them, leaving these skins behind. Now that you know what bed bugs look like through all stages of development. 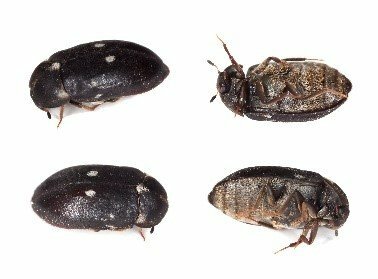 Let’s look at “other” bugs that resemble the bed bug. A professional may not, but untrained eyes assume they are. 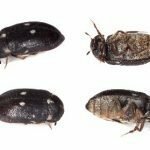 Although carpet beetles are small, round and brown, they have distinct wings, unlike the bed bug. Their larvae resemble furry little caterpillars. Carpet beetles do not bite, but some people experience welts when exposed to their tiny hairs. Ticks are parasites that live off the blood of mammals, birds, and sometimes reptiles and amphibians. Ticks are vectors of a number of diseases that affect both humans and animals. Cockroach nymphs hide in cracks and crevices preferring to stay close to food, warmth, and moisture. They are most active at night. 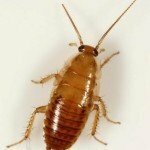 They appear white immediately after hatching or molting, and quickly turn a reddish brown, (much like a bed bug). However, the cockroach nymph is more like the shape of a cylinder, whereas a bed bug is shorter and oval, or small apple-seed in shape (not necessarily in size). Exposure to these can lead to asthma and trigger asthma attacks. 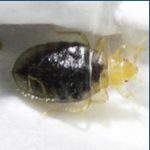 Booklice are commonly mistaken for bed bug nymphs. 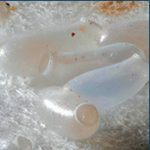 They are smaller, ranging from translucent white to gray or brown in color. They can often be found under wallpaper and along the sides of windows and windowsills. Their primary food source is fungi, pollen, mold, and fragments of dead insects. 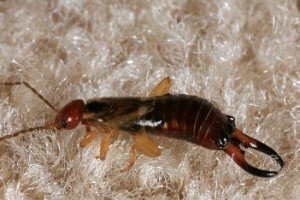 Earwigs have a pair of forceps-like pincers that protrude from their abdomen. Male pincers are curved, while females are straight. The pincers are used to capture prey and defend themselves. Always keep the suspected bug (don’t flush it! ), and have it verified by a professional. 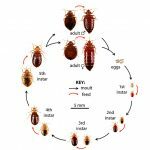 Remember, finding bed bugs early can help you to get them eliminated BEFORE they become a breeding ground in your home or offices. Having Bedbugdot in place will assist you in early detection! 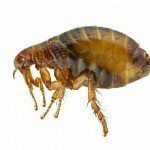 Bed Bug Lifecycles and ID cards are available from many pest professionals, just ask around! Some pest control companies offer free bug identification on their website or by text. Talk to your local pest professionals. I know now it’s ticks. I do have 3 dogs and 3 puppies. I will be taking care of this problem now. My neighbor had a little red flat bug with a little black dot on it and I’m still not sure what kind of bug this is but I guess this site was helpful . If anyone else has an idea what this little peak could be a reply to my comment would sure be helpful to us . I’ve been seeing bugs in my bedroom, including a few on or near my bed, but mostly in my window sill, that don’t resemble bed bugs. They’re very small, appear to have wings, and are straight-shaped (they’re hard to describe, but that’s the best I can do). When I use my iPad in bed at night I sometimes see them on it. I did have bed bugs over a year ago so, while I’m pretty that’s not what these are, I can still do without them. I have too much going on without them. 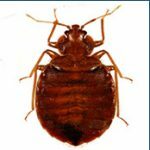 The best way to eliminate a bed bug infestation is heat!